We just dropped our daughter off at camp, so to keep my emotions in check, I spent the latter part of yesterday making Blackberry Cream Pie. It’s a berry pie, and what’s special about it is there’s a fat ribbon of cream cheese and sour cream underneath all those berries. For the crust, you can use any baked crust. The recipe below is for an all-butter crust that is baked and cooled. The crust (adapted from one from Rebecca Rather) can be made in a stand mixer or a food processor, and it gives you a pretty generous amount of dough. After baking and cooling the crust, the next step is to rub a thin layer of cream cheese mixture over it. That gets covered with a layer of fresh berries, and then a final layer of partially mashed berries is poured over the top. You can chill it for as little as for hours, but it slices a little more neatly if you chill it for a longer period such as overnight. UPDATE: Here’s another pie crust recipe that looks good. Williams Sonoma has one that uses 100% butter and is also made in a stand mixer using the paddle. Make the Crust. In bowl of a stand mixer, stir together flour, sugar, salt. Alternately, you can do this in a food processor. Add cut up butter. 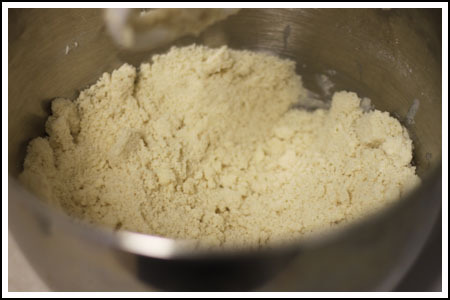 With the paddle attached and mixer set on medium low, run for about a 1 ½ minutes or until mixture starts to look crumbly and butter is dispersed (or process in pulses). With mixer on low, add the water and mix just until the mixture comes together – be careful not to overwork it. Empty onto a clean surface and shape into a disc. Wrap in plastic wrap and chill for 1 hour or until ready to use. Let dough sit on counter for about 20 minutes. Roll into a large circle and fit into a 9 inch deep dish pie plate so that it covers sides. Cover with foil, weigh down with pie weights. Bake at 425 for 15 minutes. Remove foil and pie weights and bake for another 5-10 minutes or until golden brown. Let cool. Make the filling. Set aside 1 cup of the blackberries and put remaining 4 cups of blackberries in a medium saucepan. Combine sugar and cornstarch and pour over berries, stirring so that they are coated in the sugar mixture. Turn heat to medium and cook for about 8-10 minutes, stirring and mashing as you go, until berry mixture boils, thickens and the cornstarch loses its chalkiness. Remove from heat, pour into a bowl and stir in the lemon juice. Let the berry mixture cool for about an hour. 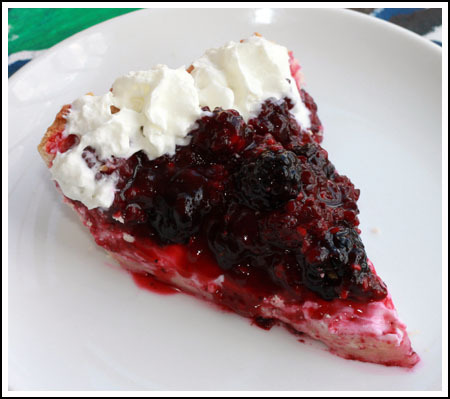 Mix together the cream cheese, sour cream and sugar and spread across cool baked pie shell. 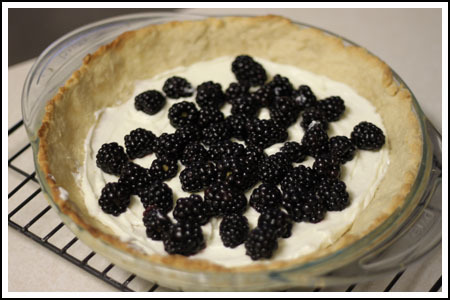 Scatter the reserved 1 cup of the fresh blackberries across the cream mixture. Pour the cooked berries over the top and chill for 3 or more hours. Cook time includes approximate chill time. It's just an estimate. This looks fantastic. I’m going to make it on Friday to take to a cookout this weekend – my parents are huge blackberry fans and they will love this! Last night I meant to add that I hope that Fuzz has a great time at camp. I’m sure she will! Your comments to Kim are spot on, but I know you miss her. Do something to pamper yourself while she’s gone. Maybe a pedicure? 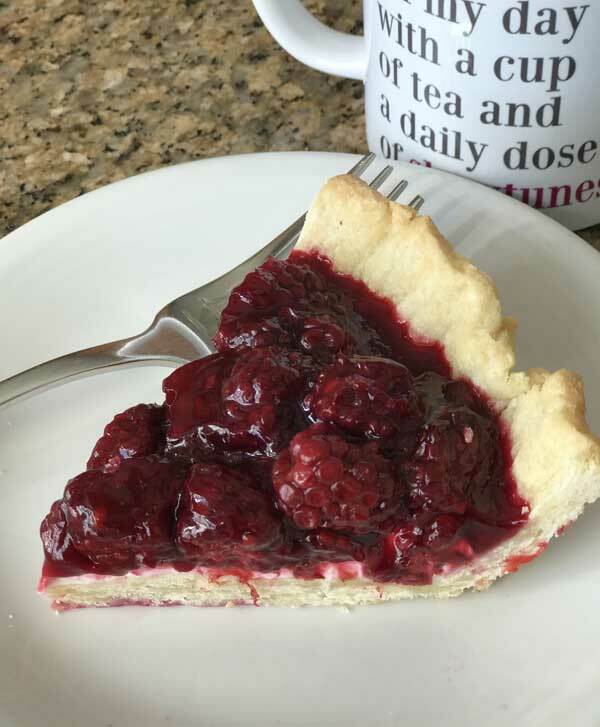 Loving your summer berry recipes! I just made your Doubletree Copycats. Delicious! I’m sure my berry-loving boy would love this! I’ll bookmark it just for him. And yet again… another dessert that must be in my life soon! Berries!! Kim, baking the pie must have helped thwart panic attacks. I’m glad your son had fun and wanted an extra week. As much as I miss her, I think it’s important for kids to develop independence and camp is certainly a growth experience…but I do hope she’s enjoying herself. Katrina, I found that Spectrum worked fine for texture, but I didn’t like the flavor of the palm oil. Sue, I agree 100%. If I came across real lard in the grocery store, I would buy it. All we have is the hydrogenated kind. Cakelaw, thanks! P.S. I hope you enjoy using your new gas oven. I’m finally getting used to electric, but in a few weeks I will be switching back to gas as well. I hope Fuzz has a good time at camp. This pie looks amazing! Your pie looks so good! I love the idea of the berry cream cheese combo! I don’t have any great tips, but I was in a store recently that sold something similar to what Joan suggested. I didn’t buy it and haven’t tried such a thing. Rolled out pie dough is the one place I concede and use shortening. I’ve made all kinds of crusts, but all shortening is the most flaky. Butter of course has more flavor but usually it’s about the filling and if the crust is nice and flaky all the better. If you can get real lard that makes great crust too, but most lard is pretty highly processed and nothing like what was sold in my family’s meat locker when I was growing up. I didn’t realize Paula’s crust was all shortening, but for years and years, I used an all shortening crust and loved it. Now I try to cut back on shortening. I still want to try hers though. Does the Spectrum shortening act/work the same as regular? I may invest in some. Ahh, the heartache and anxiety of dropping your kid off at camp for the first time… *UGH*! I think I just about had a panic attack when I got home afterwards. When I picked up my son after his first time at camp, all he said was, “Can I stay another week!” I bet Fuzz is having a great time! Karen, thanks for the camp support/empathy. I keep expecting her to call me, but of course she can’t. I hope Fuzz likes it enough to become a counselor one day. Also, thanks for the tip about the cream cheese crusts. I haven’t made a cream cheese crust in years. Rina, it’s a pretty short week. To send a care package, you have to do it before the child even leaves for camp and I am not that organized. They do allow us to send the kids email, though. 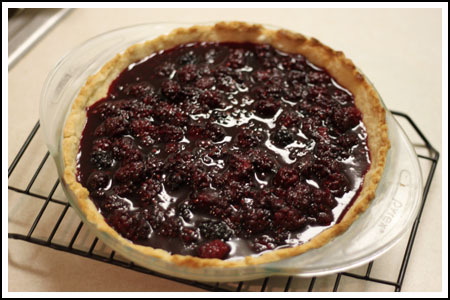 My neighborhood bakery makes a pie like this, sometimes with fresh blueberries and sometimes with fresh raspberries. It is really good. I’ve been meaning to try something like this. I’ve been doing cream cheese/butter crusts lately and have been happy without too much crust sticking. I’m sure Fuzz will have a wonderful time at camp! My daughter is now a junior counselor at the came she has attended since age 9 and plans to go back through college. I still get a lump in my throat when she goes, every time. Pam, I rarely bake in foil tins but that seems like a good idea. Maybe I could line the pan with non-stick foil, lift the whole pie from the dish, peel away the foil, make a clean cut and then put the whole (now foil free) pie back in the dish. But really, pie shouldn’t be too difficult. I think it’s just a sticky crust. Katrina, thanks for the link to Salad in a Jar. I searched around and here’s a link to her pie crust. She uses 100% shortening so her pie crust is probably really flakey and good. I like the idea of using butter, but crusts made with shortening seem to have a better texture. Mmm, I like the cream cheese addition. The berries set up nicely, too. Paula over at Salad-in-a-Jar seems to have pie crust perfected. I haven’t read everything, but maybe she has some tips. I really want to try her crust sometime. The only tip I know is for pies baked in disposable foil tins. Paula Deen cuts through the foil pan with a pair of scissors then peels it down to get the first piece out neatly. But for a metal or glass pan, I have no idea! Popped in to say hi! That looks perfect for summer!